Shares of Micron could easily rise 15% from here after Monday's bevy of good news. What's been hot all May? Well, yes, stocks in general thanks to a great earnings season and broadly improved corporate conditions going forward. What has led the equity markets? Energy and Tech. We've talked plenty on Energy. We have not really stayed focused on tech for a little while, so let's take a look. 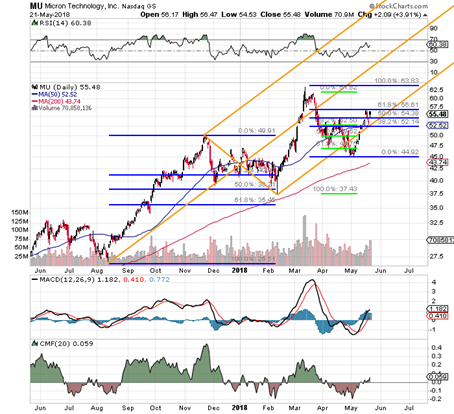 Micron Technology (MU - Get Report) . Up 3.9% on Monday. Up another bunch in the overnight. The firm held its annual investor and analyst meeting on Monday. Micron announced revenue for the third quarter would land in the $7.7 billion to $7.8 billion range, up from prior guidance of $7.2 billion to $7.6 billion. Micron's fiscal third quarter ends on May 31, by the way. The company also lifted earnings guidance to a range of $3.12 to $3.16 per share. Dudes, that's all the way up from what had been guidance of $2.76 to $2.90. That's awesome... but wait, there's more. Later on Monday, Micron and Intel (INTC - Get Report) announced that their co-developed QLC NAND flash memory is now available. This technology leverages a 64-layer structure. The firms also announced having made progress on a third generation, 96-tier 3D NAND structure. Done now? No. There is still more? Yes, Veronica, not only is there a Santa Claus, but Micron has also announced authorization to repurchase $10 billion worth of common stock as part of a plan to return at least 50% of free cash flow to investors beginning in fiscal 2019. That's only a quarter away, gang. Best of all, Micron, even after the recent surge still trades at less than six times forward-looking earnings. You missed it at sub 5x? Sub 6x is still pretty darned cheap. Intel, also a Sarge fave, and also considered cheap, trades at twice that much in comparison. The premium there is the difference in valuation between the storage game, and autonomous driving, the data center, and artificial intelligence, all playing fields where Intel must compete with Action Alerts PLUS holding Nvidia (NVDA - Get Report) , a much more highly valued stock in terms of P/E. Oh, speaking of the data center, Adobe Systems (ADBE - Get Report) also has been making some noise. The firm announced on Monday an agreement to purchase the privately held Magento Commerce for $1.68 billion. That deal is expected to close sometime in September, and is the very reason that traders put the smack-down on Magento's rival Shopify (SHOP - Get Report) . Adobe also increased the size of its own repurchase plan to $8 billion through the year 2021, which is likely why the name outperformed fellow cloud players like salesforce.com (CRM - Get Report) , and Oracle (ORCL - Get Report) on the day. Plain as the nose on your face, you can see how important the $56.60 level is to MU. The stock closed at $55.48, and is trading at $59.30 in the premarket. Should support be found Tuesday at that $56.60 level or above, a re-testing of the near $64 highs of early March becomes extremely likely, in my opinion. At the time of publication, Guilfoyle was long MU, INTC, NVDA, ADBE, AMAT, ORCL, CRM equity; short MU put options. Action Alerts PLUS, which Cramer manages as a charitable trust, is long SLB and KSS.